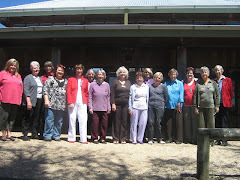 our first meeting for 2009 will be held at Logan's Cafe Gibralter St Bungendore on Tuesday February 17. 11.30 for a 12 noon start. Cost $20. We are starting the year with our AGM and hand over to the new committee for 2009. As you all are aware the elections were held last year and the new committee has already been voted on and are ready and eager to start their term of service. Following the AGM handover the new committee will hold their first meeting of the year. As usual we will have our lunch during this time. RSVP your attendance by Friday 13 February to Lorraine.Come along and bring a friend. Time passes. Life happens. Distance separates. Children grow up. Jobs come and go.Love waxes and wanes. Men don't do what they're supposed to do. Hearts break. Parents die. Colleagues forget favors. Careers end. BUT.......... Sisters are there, no matter how much time and how many miles are between you. A girl friend is never farther away than needing her can reach. When you have to walk that lonesome valley and you have to walk it by yourself, the women in your life will be on the valley's rim, cheering you on, praying for you, pulling for you, intervening on your behalf, and waiting with open arms at the valley's end. Sometimes, they will even break the rules and walk beside you...Or come in and carry you out. Girlfriends, daughters, granddaughters, daughters-in-law, sisters, sisters-in-law, Mothers, grandmothers, aunties, nieces, cousins, and extended family, all bless our life! The world wouldn't be the same without women. When we began this adventure called womanhood, we had no idea of the incredible joys or sorrows that lay ahead. Nor did we know how much we would need each other. Every day, we need each other still There are more than twenty angels in this world. Ten are peacefully sleeping on clouds. Nine are playing. And one is reading this message at this moment.